The present Survey is the sixteenth in a series of reports prepared annually by the secretariat of the Economic Commission for Asia and the Far East. A major object of these Surveys, and of the quarterly Economic Bulletins which supplement them, is the analysis of recent economic developments in, and affecting, the countries of Asia and the Far East in so far as these developments are shaped by, and help to determine, their policies. The present report provides in Part One a special study on Asia’s trade with Western Europe, with special reference to the Common Market. This Part consists of four chapters on the setting of the problem, Asia’s export to western Europe and problems of export expansion, Asia’s import from western Europe and problems of import financing, and Japan’s trade with western Europe and Asia. 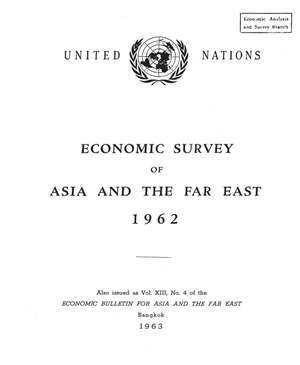 In Chapter V, which forms Part Two, the economic developments in the ECAFE region in 1962 are reviewed on the basis of the information available to the secretariat up to the time the Survey was written (January 1963).